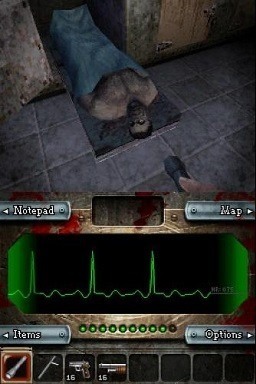 If you’re looking for a game that will make you wet your pants, then Dementium: The Ward is the game for you. It is full of surprises that will make you jump, suspense that will make your hands tremble and plot twists that make you not want to put the game down. The game is beautifully concocted with goosebump-sending audio and haunting visuals. The game starts off with you in a wheelchair, getting wheeled through the hospital. You catch disturbing glimpses of a body on the floor, a creepy girl in an elevator and zombie-like creatures lurking around the halls. You then awake in a dilapidated hospital ward some time later. During the first chapter, you are equipped with nothing but a nightstick (kind of like a baton), a torchlight and a notepad. Throughout the 16 chapters of the game, you will meet surgical-experiments-gone-wrong, horrifying boss monsters, spooky characters and puzzles that you have to solve in order to answer the questions that will linger around your head the whole game – who are you, exactly? Why are you here? How did you get here? Who is that girl? With each chapter you’ll be given a new map which will guide you through the different levels of the hospital. Every level ups the ante with increasingly difficult puzzles to crack your head over. The answers to these puzzles could be as obvious as numbers scrawled in blood on the wall or hidden inside a piano whereby you have to play certain notes to open it. Chapters also have their own cut scenes which feature flashbacks, apparitions and perturbing sights that will only bring about more questions until the end of the game. 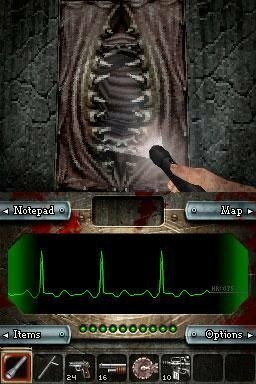 However, like all games, Dementium: The Ward has its down-sides too. The save system is rather frustrating, because when you re-enter a room, the monsters respawn but the ammo and healthpacks do not, and when you die, you have to restart the entire chapter again. Don’t let this deter you from what is quite possibly the best horror game on the platform. Intriguing storyline that keeps you hooked from start to end. A graphic first person shooter.